A lightweight, low-profile wireless system that provides guitarists with 300 feet of freedom. Not only does the Relay G90 wireless system sounds just you're using a direct cable, but it can also sound just like the cable you would normally use. It features EQ settings to match the frequency response of your guitar cable so you can switch between the Relay G90 and your cable without having to change the settings on your sound amp. Different players use different cables, but all players can use Line 6 Relay G90. 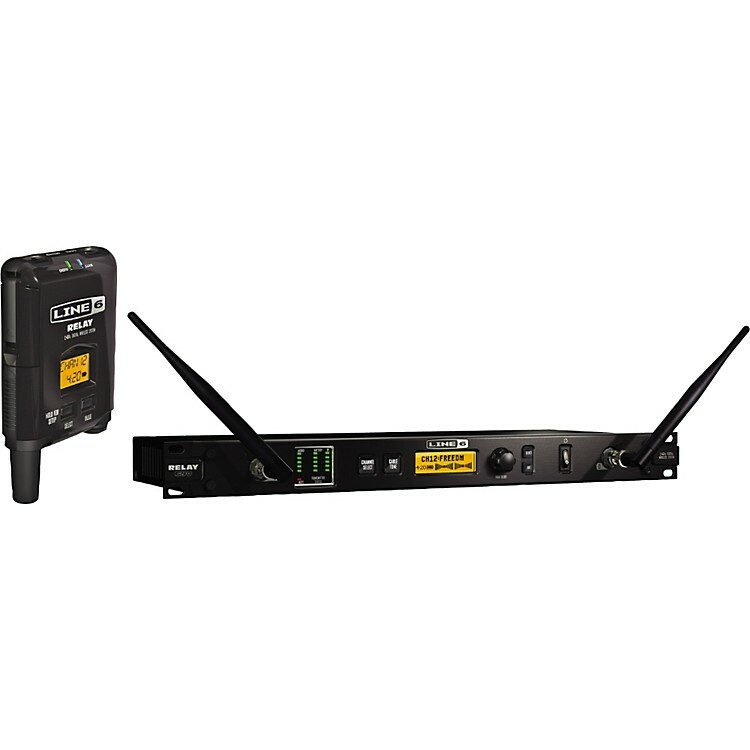 The Relay G90 wireless mic system broadcasts its robust signal over the 2.4GHz band. This keeps the signal free from many kinds of interference. For added security, it employs exclusive signal protection technology. Each of its channels broadcasts an encrypted data over four different frequencies simultaneously. Traditional wireless mic systems, on the other hand, broadcast over congested UHF bands, so their signals can be susceptible to interference generated as far away as 100 miles or more. The Relay G90 is easy to use. Bright LCDs and LEDs on the transmitter and receiver display all critical system functions including power, status, channel number, battery life, and more. Plus, it finds open channels right out of the box. The wireless instrument system includes transmitter, 1RU rack-mountable receiver, and all necessary accessories including antennas, guitar cable, power supply, and batteries. No scanning. No searching. No hassles. Order the Relay G90 Digital Wireless Guitar System today!